At a convention of the Pre-Trib Study Group in Dallas, Dr. John Walvoord presented a paper on the Pre-Tribulation Rapture and Premillennial teaching, including the history of doctrines throughout the Church age. I was very much struck by something that Dr. Walvoord said as he analyzed the transition from widely held pre-millennial views of the early church in the first three centuries to the predominantly amillennial, postmillennial or anti-millennial views that developed afterwards, and it centered around Augustine. 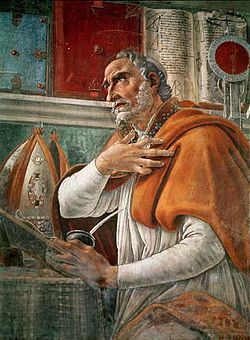 Thus Dr. Walvoord said it was his impression that it was latent anti-Semitism that caused Augustine and those around him to have this transition in their thinking. That’s a remarkable statement. How in the world can latent anti-Semitism have anything to do with one’s eschatological viewpoint, and how can it impact the eschatological viewpoint of the whole church? Well, I think that it does, and that’s one of the things we are going to be looking at in this article. There is an inherent connection between one’s attitude toward the Jewish people and Israel and one’s attitude toward the Scriptures and eschatology. How does that happen? It’s an understanding of what the Scriptures teach about the nature of the church, the nature of Israel, and the nature of the Olive Tree. As Dr. Walvoord brought out, at the time of the beginning of the Bible Conference movement, there was a rediscovery of Israel and the promises to Israel in the Scriptures. Some of the early works published in this movement had to deal with the future of Israel, as scholars began to rediscover premillennialism and literal eschatology. Of course many of the amillennialists, including Augustine, would have been shocked if someone were to say they were anti-Semitic, and they would deny it strenuously. And they would say, why, there’s not an anti-Semitic bone in my body! All we want to do (they might say) is to take away the promises that God has given to Israel and apply them to the church! Well, that sounds pretty anti-Semitic to me. Most amillennial commentaries have jumped to the conclusion that the Olive Tree is the Church, beginning in Old Testament times and continuing on to the present in its current form. Thus, the Church becomes the New Improved Israel, and the Jewish people are relegated to the dustbin of history, as an outmoded, irrelevant part of God’s plan, sort of like an appendix – a vestigial organ. With this type of thinking, replacement theology was born and continues as the dominant teaching of the vast majority of Church scholars. At the other extreme, some more recent interpreters have suggested that the Olive Tree is Israel, the Jewish people, and that Gentile believers, through their being grafted in, have become Israelites, now have a “Jewish heart,” and should be considered themselves as Jews. While this interpretation may lie closer to the truth than the replacement theology noted above, it too seems to fall short of what the Apostle Paul, inspired by the Spirit, is endeavoring to teach us. To understand the Olive Tree, it seems we have to see it in its broader context in association with the Church and Israel. The Olive Tree by Thomas S. McCall Th.D. For instance, God created the entity of marriage. That was the first entity or institution, as it were, He created, and we who are married find our relationship with our spouse to be that we are actually “one flesh.” Marriage is an entity in which we have to find our proper Scriptural relationship. Then there is the entity of the family. That’s a little different. It includes the marriage, but it’s more. There is the relationship between the parents and the child. We have to find and understand our relationship there. There are different Biblical principles involved in our relationships within the family. He created human government, and we have to find our relationship to Caesar. “Render unto Caesar the things that are Caesar’s.” We have a responsibility as citizens of government, especially when we are fortunate enough to be in a constitutional republic. The Lord has created the concept of government as well as all of these entities. God has also created work. We have to find our relationship either as an employee or an employer in a Biblical sense. There is a Biblical attitude we must understand, if we are directed by a boss or if we direct others in our livelihood. In the realm of divine covenants, though, God has also created the Church, Israel and the Olive Tree. We need to know our Scriptural relationship to all the entities God has created. The Church as the Body of Christ is described in Eph. 2. Outside the Body of Christ, are the unsaved Jews and the unsaved Gentiles. The Jews are described as being very near. Strange, many have thought that they were a long ways off out in left field, but the Scriptures describe the Jews as being near. The Gentiles are seen as being far off. Unsaved Gentiles are very far off, and between the two, Jews and Gentiles, there is a middle wall of partition. This was symbolized in the Temple, where no Gentile could pass the middle wall of partition, upon penalty of death. Outside of Christ, this wall remains, as forbidding as it ever was, and I don’t think it’s ever been removed. There is still this great wall between unsaved Jews and unsaved Gentiles. However, when Jews receive Christ, they are baptized into the Body of Christ; and when Gentiles receive Christ, they are baptized into the Body of Christ, the middle wall of partition is broken down, and we are one in Him. There is no difference in status: neither Jew nor Gentile, bond nor free, neither male nor female, we are all one in Him. We are seated together in Heavenly places in Christ Jesus. What remarkable doctrine is the Body of Christ! To the Church belong unique prophetic promises, including the Rapture before the Tribulation, the Judgment Seat of Christ, the Marriage of the Lamb, Reigning with Christ during the Millennium, and the New Jerusalem for eternity. As a member of the Body of Christ, I would not want to trade places with any other entity God has created. Furthermore, the Gentiles have a relationship to Israel. It is part of the Abrahamic covenant, and it’s either a promise or a warning to Gentiles: “I will bless them that bless thee, and curse him that curseth thee.” Thus, Gentiles can be blessed by God depending on how they relate to Israel: blessings for blessings, curses for cursings. Also, some Gentiles have become and still do become, to a certain extent, proselytes to Israel. They are added on, by submission to circumcision, the Law of Moses and to Judaism as such. 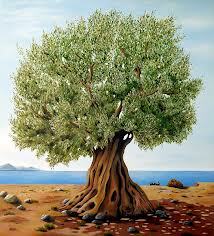 Then there is the third entity, which is the Olive Tree. It has as its roots in the fathers: Abraham, Isaac and Jacob. If the root is holy, so are the branches. This is the good and cultivated Olive Tree, which has been tended to through the centuries, and the natural branches are the Jews. They are born into the Olive Tree naturally. But, it is only believing Jews who remain in the Olive Tree. Unbelieving Jews, of all things, are broken off. They are dead, lying at the side of the tree. Strangely enough, there are also these wild olive trees, and branches from the wild olive trees that are grafted into the good Olive Tree, the cultivated Olive Tree, and live off the nourishment from the roots and the sustaining power of God. That is how the Olive Tree is described. But what is the Olive Tree? How can it be defined? First, it helps to clarify what the Olive Tree is not. It should be understood that the Olive Tree is not the Church. Some people are born naturally into the Olive Tree, but no one is born physically into the Church, the Body of Christ. The only way one can enter into the Body of Christ is by being born again by personal faith in the Lord Jesus. Furthermore, it is clear from the New Testament that the Church began at the celebration of the Feast of Pentecost after Christ ascended to Heaven, when the believers were baptized into the Body of Christ. The Church did not begin in the Old Testament! The Church began at Pentecost and will end its current ministry on the earth with the Rapture. The Olive Tree, on the other hand, began with Abraham, Isaac and Jacob, the fathers (Abraham, Isaac and Jacob), and continues on earth past the Rapture, and on through the Tribulation and the Millennium. Thus, the Olive Tree cannot be the Church. Also, the Olive Tree cannot be Israel. Some natural branches are broken off the Olive Tree, representing Jews who do not believe in Jesus the Messiah, even though they are physically still alive. They are physically alive but are spiritually dead, broken off branches. However, no one can be broken off of Israel, as long as he is physically alive. The often-heard dictum, “I was born a Jew and I will die a Jew,” is an accurate saying. Once a person is born into the covenant nation of Israel, he remains an Israelite until he is physically dead. Furthermore, Gentiles are not grafted into the nation Israel as Gentiles. The only way Gentiles can become a part of the nation Israel is by conversion to the Law of Moses and ceremonial circumcision. The Gentiles in the Olive Tree remain Gentiles, even though they have been grafted in. Thus the Olive Tree cannot be Israel. While at the Pre-Trib Conference, and before I spoke to the study group about this issue, I wanted to discuss it with Arnold Fruchtenbaum, who has done a lot of work on Jewish studies, including his major book on Israelology. He reviewed this material, and made an interesting suggestion. 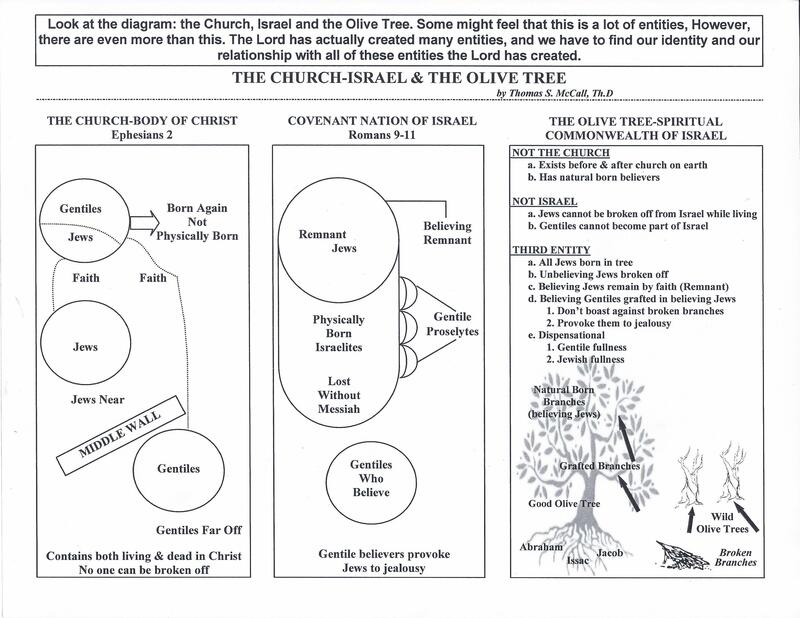 He pointed out that since the Jews in the end time “will be grafted into their own olive tree,” this shows that the Jews possess the Olive Tree, and therefore the Olive Tree is not identical to the Jews or Israel. This further strengthens the argument that the Olive Tree is not Israel. If the Olive Tree is not the Church and it is not Israel, what is it? The Olive Tree is a tertiam quid, a third entity, in this whole series of relationships. Some have suggested it should be called the Abrahamic Covenant, and that approximates a good definition. It comes close to what is involved here. Some say it’s the position of spiritual blessing, and that also comes close to the truth. I would suggest that a good working definition of the Olive Tree is that it is the Spiritual Commonwealth of Israel, and each of those terms has meaning. 11Wherefore remember, that ye being in time past Gentiles in the flesh, who are called Uncircumcision by that which is called the Circumcision in the flesh made by hands; 12That at that time ye were without Christ, being aliens from the commonwealth of Israel, and strangers from the covenants of promise, having no hope, and without God in the world: 13But now in Christ Jesus ye who sometimes were far off are made nigh by the blood of Christ. That is a very stinging rebuke of unsaved Gentiles. The Scriptures say some pretty hard things about unsaved Jewish people, but nothing comes close, I think, to this description of unsaved Gentiles, “being aliens from the commonwealth of Israel, having no hope and without God in the world.” Did you know that you, if you are a Gentile, were an alien before you received the Lord? But in Christ, we have been brought near to the Commonwealth of Israel, and it is indeed spiritual. Let us consider further these distinct terms of our working definition: the Spiritual Commonwealth of Israel. In contrast to the nation Israel, composed of believers and unbelievers, the Olive Tree is spiritual, because only righteous, born again, blood bought believers are in the Olive Tree, whether Jews or Gentiles. Nobody else is in it. Unsaved Gentiles are not in the Olive Tree. Unsaved Jews do not remain in the Olive Tree. Only born again believers are in the Olive Tree. The word the Apostle uses for commonwealth is “politeiva” (politeias), akin to our politics, people-hood or nationhood. Through the blood of Israel’s Messiah (Christ), we Gentiles who were once aliens, have been made nigh (near) to the Commonwealth of Israel. It appears that what Paul is describing as the Commonwealth of Israel is very similar to what he describes in more detail as the Olive Tree. Furthermore, the Olive Tree is the Commonwealth of Israel, because Gentiles who have been attached (grafted in) to the Olive Tree owe allegiance to Israel’s Book (the Bible), Israel’s God, and Israel’s Messiah. It is similar to the British Commonwealth, in which the people of Canada and Australia are not actually citizens of England, but owe allegiance to the Queen, and have a special relationship with the British people. We Gentiles who have trusted in Jesus the Messiah, have a special relationship with Israel, its people and Land, and have sworn allegiance to the King of the Jews. My conviction, then, is that the Olive Tree is none other than the Spiritual Commonwealth of Israel. Gentile believers also have a special relationship with the revived nation of Israel. To some Christians, Israel has no more significance than Uganda or Pakistan. But if we understand our role in the Olive Tree, we see that we are in the Commonwealth of Israel, and everything about Israel is important to us: its history, archaeology, politics, preservation and prophecy. Nothing about the Land of the Bible should be foreign to us, as the time of the return of the Messiah draws ever nearer, when Jerusalem, Israel’s capital, will be a prime focus of the Lord’s Millennial reign on earth. Why would Gentile believers boast against the unsaved Jewish branches? Amazingly, they would boast that the Jews were broken off, so that the Gentiles could replace them. This is the origin of Replacement Theology, which blossomed so greatly early in church history, and continues unabated until today. As it is understood today, the largely Gentile Church has replaced the Israel of the Old Testament. Indeed, the Church is the new, improved and enlarged Israel. This has become the predominant theological view in most Christian circles, and is also found in evangelical circles, as well. The Lord, however, condemns this boasting against the branches as something that is abhorrent to Him. One of the responsibilities that Gentiles who believe in Christ have toward the nation Israel is to provoke them to jealousy, as we read in Romans 11. We must admit we have not done a very good job. Some have said, rather than provoking the Jews to jealousy, we have mostly just provoked the Jews. But when a Jewish person sees Gentile believers in Christ, his reaction is supposed to be, “What is that Gentile, that goy, doing with my God, my Bible and my Messiah? I want them.” The good part about it is that we can all have them. But I fear that we have not live our lives in such a way that it would cause many Jewish people to be provoked to jealousy. As stated as the outset, the Olive Tree has been an enigma to Bible interpreters for most of the church age, and is often ignored more than explored. My conviction is that the Olive Tree is the Spiritual Commonwealth of Israel. It does not detract from the unique features of the Church or Israel, but it is a special entity created by God. Just as we need to find our proper relationship to the Church and Israel, we also must relate in an obedient manner with reference to the Olive Tree. Anything less would be intentional blindness to the revealed Word of God. There is also a serious problem about attempting to do prophetic study with an attitude that ignores the teachings of the Olive Tree and leans toward an anti-Semitic or anti-Israel position. There are wonderful prophecies specifically about the Church in the Scriptures, including the imminent Rapture, the Judgment Seat of Christ, the Marriage of the Lamb, the reigning with Christ in the Millennium, and the New Jerusalem. However, most of the volume of prophecy in the Bible has to do with the future destiny of Israel, such as Preservation in the Diaspora, the Perpetual Remnant, the Time of Jacob’s Trouble, the National Reconciliation with Messiah Jesus, the Restoration of Israel in preparation for and during the Millennium, and the New Jerusalem. If we do not understand Israel or the Olive Tree, we will be prone to make many errors in interpretation of Bible Prophecy. Sadly, this is what has happened in much of church history, in the development of Replacement Theology, Amillennialism, and, more recently, Progressive Dispensationalism. It is only the Apostolic premillennial, literal interpretation of the Word that recognizes the Church, Israel and the Olive Tree, and their rightful position in the plan of God. The prophet Zechariah received eight visions in one night in the fall of 520 B.C. assuring him that Israel had a future even though they had been in Babylon since 586 B.C. They would still have a future. In the book of Daniel God let’s us see the Gentile government control of world government bodies until the Lord sets up His Messianic Kingdom. In the book of Zechariah He let’s us see that the Gentiles do not have all the power and control that it seems. Here he shows Zechariah that He is working behind the scenes to bring His plan for the Jews and this world to fulfillment. This vision is number five of the first eight. 1 And the angel that talked with me came again, and waked me, as a man that is wakened out of his sleep (ASV 1901). The angel that talked to Zechariah before again connects with him. He is the malakh haddobher bi—the angel that talked with me, or, literally, “in me”—and he is not the same as the Malakh Yehovah, The Angel of Jehovah. Just as before Zechariah does not address this angel as Adonai, “my Lord”. So again this is not the same as the Divine Angel of Jehovah—the Messenger of the Covenant—but an attendant angel whose mission it was to be God’s conveyer or messenger to the prophet of the meaning of the visions. Remember that God uses angelic messengers to bring His messages to humans (Revelation 1:1 etc.). After receiving the first four visions of the one night Zechariah must have been nearly exhausted. The angel now calls him to alertness. But, a better translation of wakened out of his sleep would be “roused me as if I had been sleeping.” We see the same exhaustion coming upon the prophet Daniel after he received the vision of the beasts in chapter eight of his book. Gabriel the angel explained the vision and Daniel became ill and unable to function for several days. This lets us realize the impact a connection with the spiritual world can have when the Lord God is providing His prophets with prophecies of future earthly events. It was not as though Zechariah had fallen asleep. He was spiritually wrung out and needed to be re-kindled to receive the next vision. He therefore resembled, like Daniel, one who appeared to be sleeping. The fourth vision depicted in a symbolic but very graphic way the spiritual salvation of Israel from sin and defilement. Even though the topic was seen as their outward deliverance from captivity and oppression in the preceding three visions it looked further into the future when all Israel will be saved (Romans 11:27). 2And he said unto me, What seest thou? And I said, I have seen, and, behold, a candlestick all of gold, with its bowl upon the top of it, and its seven lamps thereon; there are seven pipes to each of the lamps, which are upon the top thereof; 3and two olive-trees by it, one upon the right side of the bowl, and the other upon the left side there of (ASV 1901). The malakh haddobher bi asks Zechariah what is it that he is seeing. He wants Zechariah to verbalize the vision he is having and to make sure it is accurate so there is no satanic intervention to corrupt the vision. After all Satan has been accusing Joshua and Israel in general at the bar of God the Father. Satan is a deceiver and will corrupt all and any he can to draw mankind away from God. Zechariah then goes on to relate the vision he just has been permitted to view. 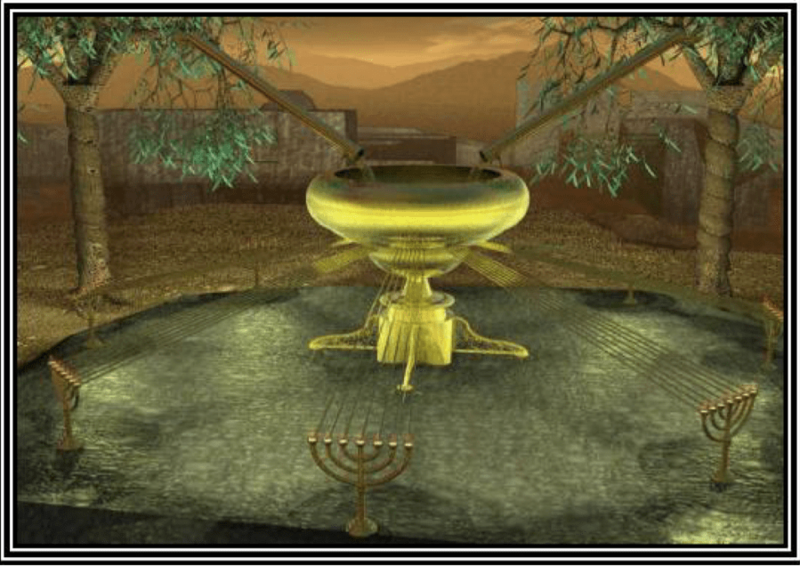 He starts by saying, I saw “a candlestick all of gold, with its bowl upon the top of it, and its seven lamps thereon; there are seven pipes to each of the lamps, which are upon the top thereof;” What he is describing is the menorah from the temple with some significant differences indicating that this is a second temple or Millennial Kingdom view. The candlestick in Zechariah’s vision is a figurative representation of the seven-branched candlestick in the Temple. 31And thou shalt make a candlestick of pure gold: of beaten work shall the candlestick be made, even its base, and its shaft; its cups, its knops, and its flowers, shall be of one piece with it. 32And there shall be six branches going out of the sides thereof; three branches of the candlestick out of the one side thereof, and three branches of the candlestick out of the other side thereof: 33three cups made like almond-blossoms in one branch, a knop and a flower; and three cups made like almond-blossoms in the other branch, a knop and a flower: so for the six branches going out of the candlestick: 34and in the candlestick four cups made like almond-blossoms, the knops thereof, and the flowers thereof; 35and a knop under two branches of one piece with it, and a knop under two branches of one piece with it, and a knop under two branches of one piece with it, for the six branches going out of the candlestick. 36Their knops and their branches shall be of one piece with it; the whole of it one beaten work of pure gold. 37And thou shalt make the lamps thereof, seven: and they shall light the lamps thereof, to give light over against it. 38And the snuffers thereof, and the snuffdishes thereof, shall be of pure gold. 39Of a talent of pure gold shall it be made, with all these vessels. 40And see that thou make them after their pattern, which hath been showed thee in the mount (ASV 1901). In the tabernacle and the temple after that pure oil was brought by the general congregation to the place of worship to have the oil poured into the lamp by the priests. The lamp was to burn at all times and was never to go out. The imagery of oil was a representation of the Holy Spirit of God (Leviticus 2:1-2; Matthew 25:1-13 etc.). This is not Him but a manifestation of Him in time and space. It is important to see that it was individuals that put the oil into the lamp. The candlestick has the representation of something lighting or being lighted. In the tabernacle and temple it was two fold. One God’s Spirit represented by the oil would radiate out to the Children of Israel to demonstrate His presence in their midst. Two, it was to be a light-bearer to the nations around them. They were to be a witness for God to the Gentiles. When a God appointed purveyor of His Word loses that blessing to be a witness for Him, it is said that the Lord takes away his candlestick (Revelation 2:5). In other words the Holy Spirit who teaches us all things and is represented by the oil will no longer do His work through us if we turn away from Him in sin. Therefore the imagery of the candlestick, which holds the oil and allows the light to radiate out, is removed from those who do not properly carry out their God given responsibilities to act correctly and speak God’s Word correctly as well. Their spiritual condition and physical manifestation of that must be acting in concert as representatives of the Lord. The Lord took way the Israelites lampstand after He showed Ezekiel the sins they were committing in the temple (Ezekiel 8:1-18). In this vision there are three distinct differences from the candlestick of the temple and tabernacle. Zechariah’s candlestick has its own oil vessel (gullah or basin) on top of it for supplying oil by gravity feed. These are bowls to automatically feed oil by means of gravity. This was not in the temple or tabernacle but there the priests who received oil from offerings of the congregation members filled it. This new apparatus will allow a new and different means of filling. In this vision, no attendant priests are necessary, or offerings of oil from the congregation. The lamps are fed continuously from the gullah, or oil vessel, above the candlestick, the abundance of the flow of oil (emblem­atic of the abundant outpouring of the Holy Spirit) being set forth by the seven pipes (or “pourers”), which carried the supply to each. 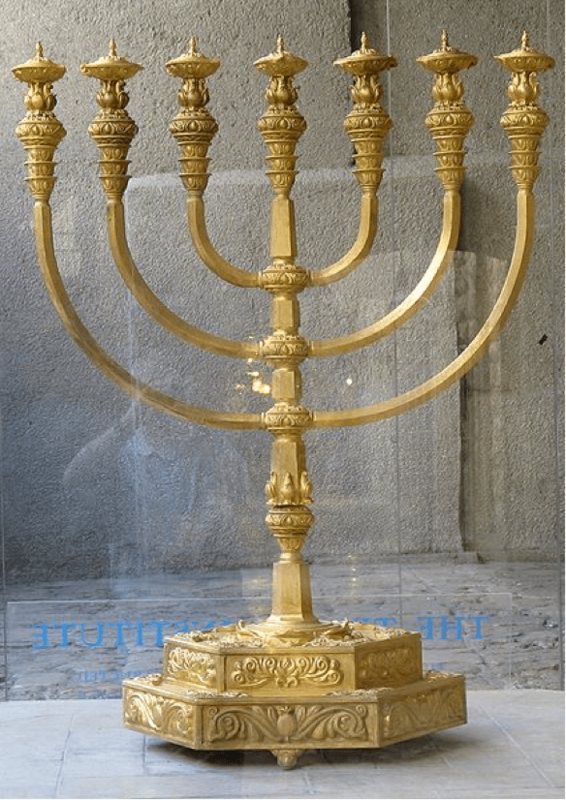 Zechariah’s lampstand has seven pipes (Hebrew mutsagoth, tubes or conduits) through which oil is poured from yatsage to pour, flow, or cast [I Kings 22:35; Job 38:38]). These seven pipes connect with each lamp so there are forty-nine in all. By contrast the tabernacle or temple candlestick had no pipes at all, but only seven branches or arms (qanim) to hold the lamps. This lampstand has two olive trees, one on either side. These each have fruitful branches supplying the oil to the gullah through two additional pipes. These two trees will continually supply oil to the lamps in abundance. 4And I answered and spake to the angel that talked with me, saying, What are these, my lord? 5Then the angel that talked with me answered and said unto me, Knowest thou not what these are? And I said, No, my lord (ASV 1901). Zechariah is asking the malakh haddobher bi what exactly this vision means. He is addressing him as lord or one above me in stature not as God. The word adon (lord or overseer) is used here not the word Adonai with its indicated deity. The angel answers him with a question saying surely you must know what this is? In a very humble manner Zechariah says that he does not know the meaning of this vision. 6Then he answered and spake unto me, saying, This is the word of Jehovah unto Zerubbabel, saying, Not by might, nor by power, but by my Spirit, saith Jehovah of hosts. 7Who art thou, O great mountain? before Zerubbabel thou shalt become a plain; and he shall bring forth the top stone with shoutings of Grace, grace, unto it. 8Moreover the word of Jehovah came unto me, saying, 9The hands of Zerubbabel have laid the foundation of this house; his hands shall also finish it; and thou shalt know that Jehovah of hosts hath sent me unto you. 10For who hath despised the day of small things? for these seven shall rejoice, and shall see the plummet in the hand of Zerubbabel; these are the eyes of Jehovah, which run to and fro through the whole earth (ASV 1901). This is how the angel begins his interpretation of the vision: “This (vision in as far as it embodies a prophecy) is the word of Jehovah unto Zerubbabel, saying, Not by might, nor by power, but by My Spirit, saith Jehovah of hosts.” The Hebrew word hayil (“might”), which also means an “army,” or “host,” stands for the strength of many. This meant to express human strength and power of every description—physical, mental, and moral—individual, or the combined strength of the multitude. All of these are not able to do what the Spirit of God can do. The genuine power by which Israel’s charge on this earth is set forth by the candlestick, shall eventually be fulfilled by “My Spirit, saith Jehovah.” God Himself will be the only power given to Zerubbabel to accomplish the task of rebuilding the Temple. This will all result in a restoration of Israel’s mission as a light to the world. The temple will be the visible proof and symbol of the restored fellowship between Jehovah and His people, and Israel’s mission as the light of the nations. Joshua will be the High Priest and Zerubbabel will be the governor of Jerusalem. The last vision number four saw Joshua reinstated as the religious head of the Jews now Zerubbabel is being appointed as the civil head with the assurance that God will provide the power to do God’s work as once upon a time the ancient Israelites earnestly did. Zerubbabel would be the one to finish the temple during his lifetime and the angel was assuring Zechariah of these things because Jehovah Himself sent him to convey the message. Any and all voices of opposition would also be silenced. There will be joy when the plum lines are visible. The finishing of this building will happen amidst loud cries of the people, “Grace, grace unto it.” Therefore not on the great world powers but on the little “stone of lead” (Christ) or “plummet” in the hand of Zerubbabel, who is superintending the work of building, as well as the seven eyes of God’s special providence rest, will this be accomplished. The seven refer to the previous vision. God’s eyes run to and fro through the whole earth, and nothing is hid from His omniscience. He will see to it that nothing shall prevent the work being brought to completion. 11Then answered I, and said unto him, What are these two olive-trees upon the right side of the candlestick and upon the left side thereof? 12And I answered the second time, and said unto him, What are these two olive-branches, which are beside the two golden spouts, that empty the golden oil out of themselves? 13And he answered me and said, Knowest thou not what these are? And I said, No, my lord. 14Then said he, These are the two anointed ones, that stand by the Lord of the whole earth (ASV 1901). Zechariah asks the angel one more question regarding the olive trees. He wants to know the meaning of these olive trees and is met with the same question, “Don’t’ you know?” The answer is simple; they represent Joshua the high priest and the prince Zerubbabel. These stand by the Lord of the whole earth, as the divinely appointed instruments through whom the Lord causes His Spirit to flow into His congregation. The olive trees represent these two men. They are feeding God’s Spirit into Israel and the task of rebuilding the Temple. This imagery is also used in Revelation chapter eleven of the two witnesses for the Lord during the Great Tribulation that bring forth God’s Spirit during that yet future troubled time (Revelation 11:45).